Because you’re likely to take your iPad on the road on a regular basis, it’s a good idea to consider a few security features. Some save battery life and protect your data or access to certain apps. Auto-Lock: Turns off your display to save battery power. You can set the amount of time you want to expire before Auto-Lock locks your iPad. Passcode Lock: Assigns a passcode to the Lock screen. You can set a passcode, turn it on or off, change the passcode, and set the time interval at which your passcode is required. This is useful if you don’t want to bother with a passcode for only brief periods of locking your iPad. Finally, you can use the Erase Data after Ten Failed Passcode Attempts setting so that multiple failed attempts to access your device results in your iPad erasing all data on it. This could protect, for example, your contacts’ information or map data that shows your location from prying eyes. Note that if Simple Passcode is turned on (the default setting), you’re limited to a four-digit passcode. If you turn off the Simple Passcode setting, you can use a longer, stronger, password using a combination of letters and numbers. 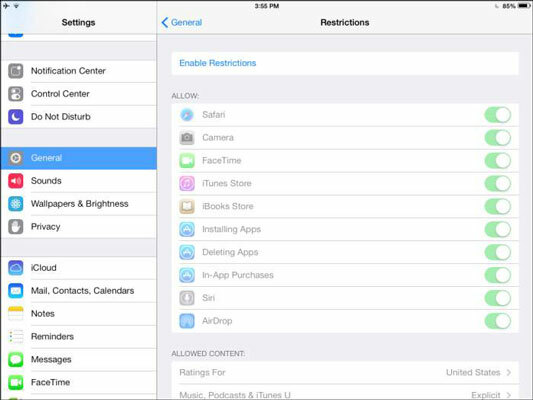 Restrictions: Allows you to restrict access to certain apps and content using a passcode. This is useful if you don’t want your kids to access a particularly adult app or simply don’t want them browsing with Safari or buying things with iTunes, for example. Choose the apps or content you want to restrict in this pane. If you forget a passcode, the only thing to do is restore iPad software, which can be a headache. The obvious advice here: Don’t forget your passcode!